One of the things I was looking forward to about living in Europe, was all the endless possibilities to discover and travel around Europe. Other than a few visits to my friend in Frankfurt and a trip my grandmother took me on when I was 6, I haven't seen Europe. This weekend being the first long weekend since I've been here, I've planned a trip to head out and explore. It was hard deciding where to go first. The great thing about Nuremberg is that there are endless places to go within a 4 hour drive. 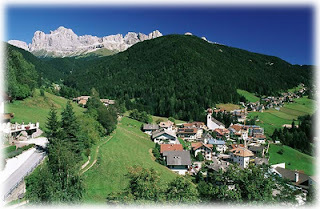 It seems quintesential "europe": cute village, amazing mountains and rolling hills. I'm going with a girlfriend and my dog. We're looking forward to exploring, hiking, cappucinos on patios (and maybe getting hit on by cute Italian men) and delicious food. "this" is a hay bath famous in South Tyrolia. A hay bath is meant to be relaxing, rejuvenating and can help some skin issues. And all I can think of is "ick." Not only do I have a wicked grass allergy that would surely give me hives, leaking eyes and nose, but I can't imagine this being relaxing (histamine overload aside) wouldn't it be itchy as hell? Part of me is tempted to overload on the anti-histamines and try it out of curiosity, but I fear I'll be picking hay bits out for days!